There are many sources for free, or nearly free, ABC writing worksheets for kindergarten to download online. If you are inclined to make your own worksheets from downloadable resources, you can better customize them to meet your child's individual needs. One of the most versatile options to create your own ABC writing worksheets for kindergarten is to download a free, ruled print font called "Penmanship Print". Use the font with your word processing program to type out the letters of the alphabet and print for your child. This simple font includes top and bottom solid horizontal guidelines with a center dashed line. You can even create ruled paper, or you can create blank ruled spaces between letters by typing the grave character. This will give your child room to copy letters. The grave character looks like a reverse apostrophe, and is the last key on the left side of your keyboard, adjacent to the numeral one. You can also change the font color of the letters to light gray so that your child can trace letters and words. If your child will be attending elementary school at some point, you may want to purchase ABC writing worksheets for kindergarten at a local teacher supply store. Many of the free ABC fonts will not exactly match the letter style that your school district uses. For example, the "Penmanship Print" font has a lower-case letter q that does not curl up from the bottom-right, though most schools teach children to write it with a curl. Your child could encounter problems if taught to write letters in a style different from that which your local schools promote, so consider this in choosing your fonts or worksheets. Introduce your child to writing his ABCs one letter at a time by having him color one alphabet coloring page for each letter. Next, have your child trace and then copy just one letter until you feel confident that he has learned the letter's structure before moving on to the next letter of the alphabet. Don't overwhelm your kindergartener with all the letters at once unless you are sure he is ready to handle it. Otherwise you risk discouraging your child and creating a potential learning block. Your child should begin by tracing the letters before you ask her to copy them unless she has already demonstrated strong hand-eye coordination and independence. On the other hand, she should move into copying the letters and writing them without help as soon as possible so that she does not become too dependent on tracing them. While your child is learning to write his ABCs, this is the best time to teach him the sound that each letter makes. You can mix the writing lessons up to keep your child from getting bored by adding a quick flash card lesson here and there. 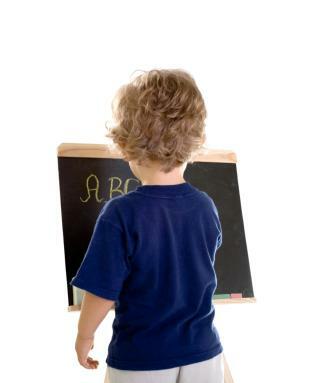 Begin with just showing your child the first four letters of the alphabet, and add one more ABC flash card after he masters those he has already seen. This will help prepare your child for learning phonics or sight-reading. There are good membership websites for homeschoolers that you can join for a fee, and that offer many printable worksheets. Some of these sites offer useful online activities for your kindergartener, but with all the free, downloadable resources available, it's not necessary to pay for worksheets. After your child has successfully learned to write the alphabet, you can encourage her further with a printable kindergarten report card. Using ABC writing worksheets for kindergarten will give your child an excellent boost toward becoming a strong reader. This may well be one of the greatest factors in determining whether he succeeds in school and in life. Most importantly, encourage your child to have fun learning the alphabet so that she can begin to expect education to be an enjoyable experience. Education is one of the greatest gifts you can give to your child.